My dad makes the best dressing in the world. He really does. His turkey is the best too, but if I had to choose between one or the other, I would take the dressing any day. Or even every day. I remember so many family holidays with Dad navigating the kitchen, rotating items in and out of the oven and trying to carve the turkey while my brother, mother and I snuck in and out to “sample” the dressing when Dad’s back was turned. The nicely browned chunks that clung to the side of the baking dish were the most coveted bits. The almost-crunchy exterior of those pieces nicely offset the moist and steaming morsels underneath. Those went first, so you had to get in quick before they were picked off by a rival relative. It’s a wonder there was ever any left for the meal. One year Dad let me follow him around the kitchen as he created this magical concoction. I hovered, pestered him with questions and got in the way, but took careful notes and approximate measurements. 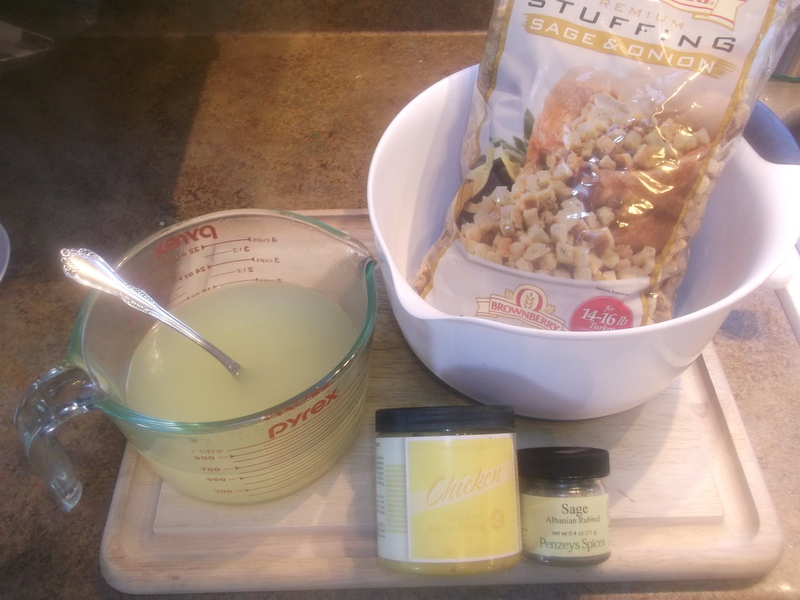 I was surprised at how few ingredients were involved, and at how easy it really was to make. Of course, I don’t quite have his special blend of magic that makes this dressing off-the-charts delicious, but this recipe comes awfully close. 1) This recipe is for dressing as a side dish, baked separately. If using as stuffing for a turkey, there are some additional steps/ingredients that I will include in italics, even though I don’t have the photos for those steps. The main difference is that you get giblets with a whole turkey, which I didn’t have when I made this. 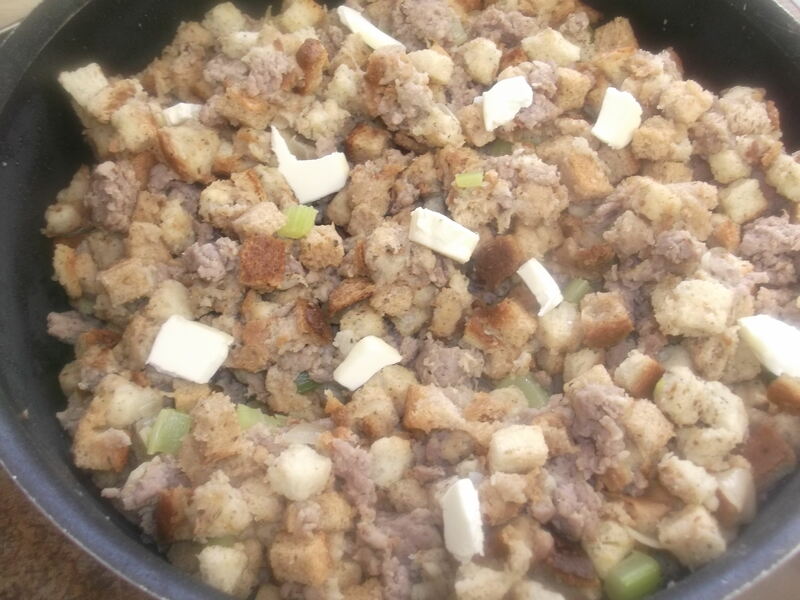 2) Another difference is that when stuffing a turkey, which has probably been brined, you’ll want less salt/sodium (therefore less chicken broth/stock) in the stuffing than in a dressing baked separately. For stuffing a turkey: boil the turkey giblets for an hour, until soft, in enough water to cover them (about 1 C). Retain the cooking water and remove the giblets. Dice the giblets into very small pieces and set aside. Add 1-2 T of butter to the giblet water and stir until it melts. Find a large pan with a good cover: you can make and bake the dressing all in this same pan. Brown the sausage over medium-high heat, breaking it apart, until most of the red color is gone. 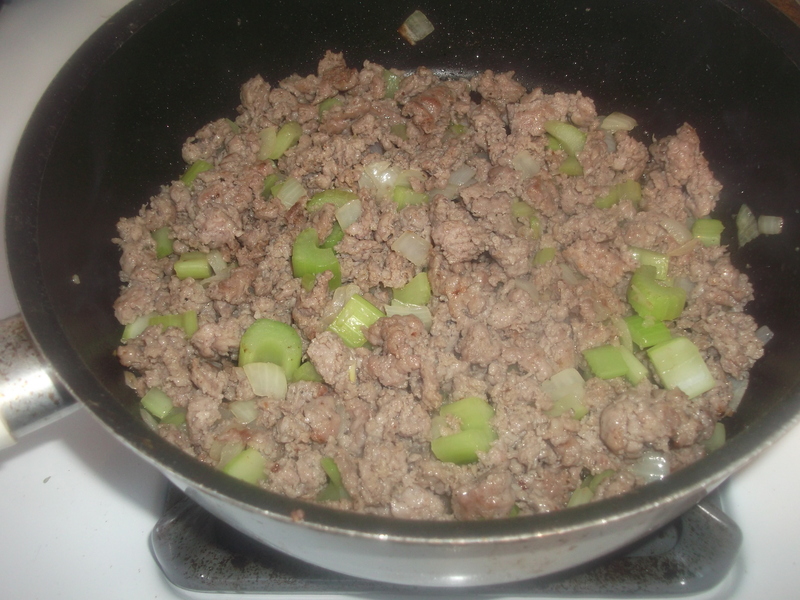 Then add the celery and onions and cook until they have softened, 10-15 minutes. 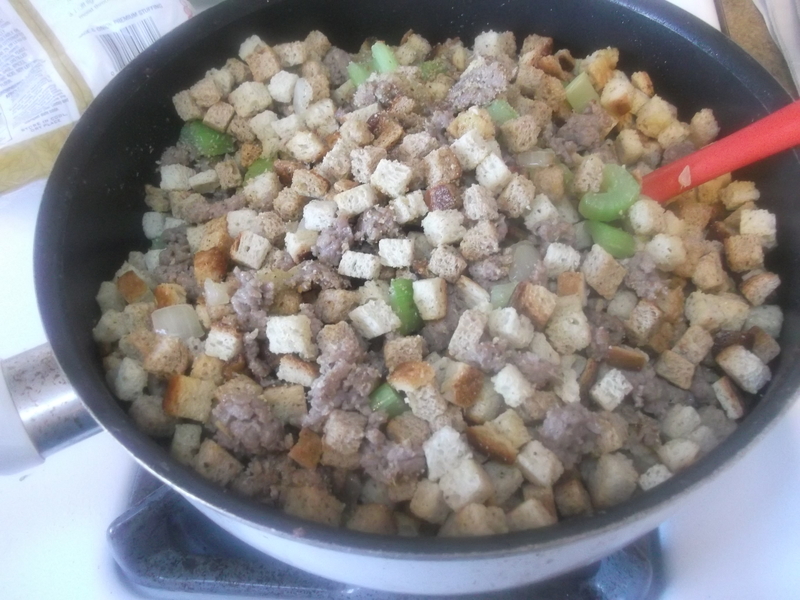 Stir in the stuffing cubes and mix well. Pour in the liquid* and stir to combine until most of the liquid has been absorbed. The mixture should be wet enough that the cubes keep their shape but where the very middle isn’t quite wet. * For stuffing a turkey: pour in the giblet water with melted butter first, and then add just enough of the chicken stock to reach the right consistency. Add the diced giblets last. The dressing can be cooked (or stuffed) at this point, or covered and refrigerated to bake later. Dot the top of the dressing with 1-2 T of butter, broken into smaller pieces, and bake, covered, at 350 degrees for 30-45 minutes. Add a little extra liquid if it seems dry. 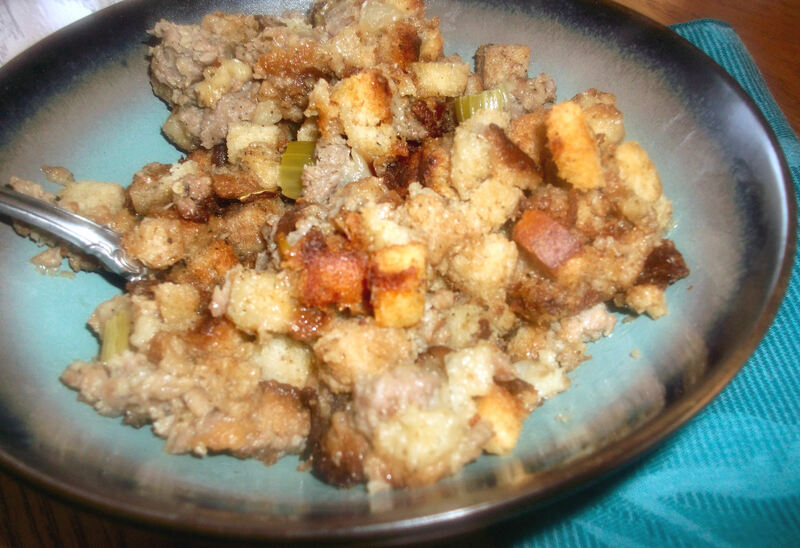 Keep the dressing and the turkey at the same temp when stuffing (either both are cool, or both are at room temp). Don’t overstuff the turkey or it won’t cook all the way – keep it loose! I wasn’t making and stuffing a whole turkey when I made this, but wanted to share the steps for it anyway because it is just so good. I hope that didn’t confuse things. What follows is how I made it to be used as a side dish, baked separately. 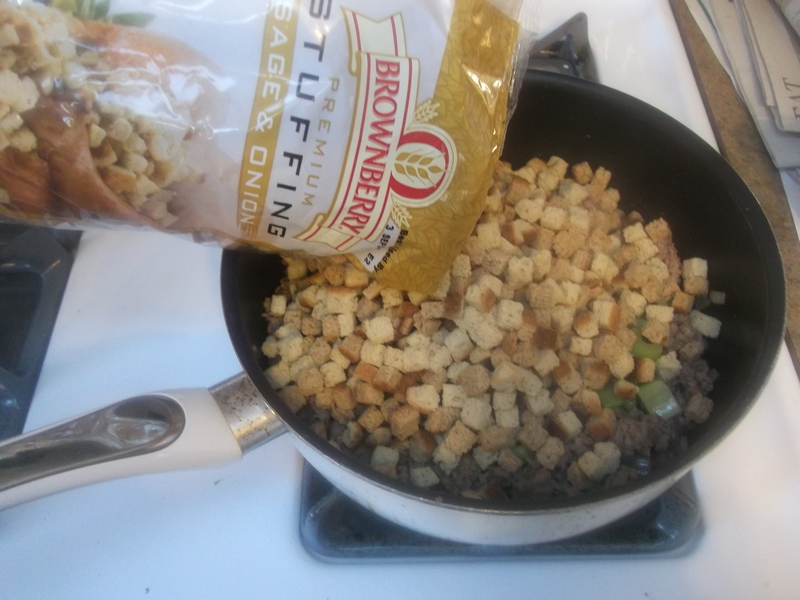 I like the sage and onion flavored stuffing cubes, but any type will do. Also, I make my own broth on demand using a Penzey’s soup base, but you can use any canned or boxed brand. Try to use a low-sodium variety so the dressing doesn’t get too salty. You can always add more salt at the table, but you can’t take it out once it’s in. One of my dad’s secret ingredients is pork breakfast sausage. You can use any national brand found in the freezer section, or choose one fresh from a local supplier. Brown the sausage over medium-high heat, breaking it apart. 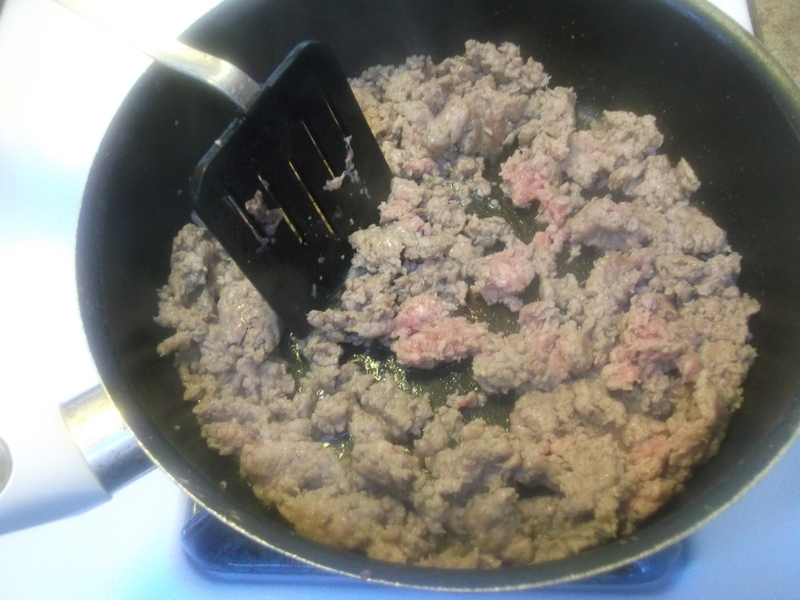 You may want to add a little butter or olive oil to the pan if using really lean sausage, like this was. 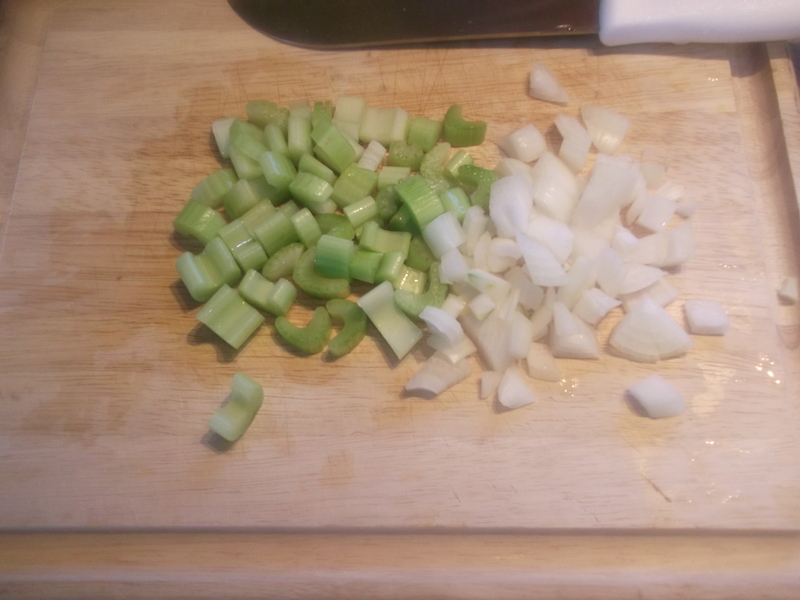 While the sausage is browning, dice the onions and celery. You’ll have about equal amounts of each. 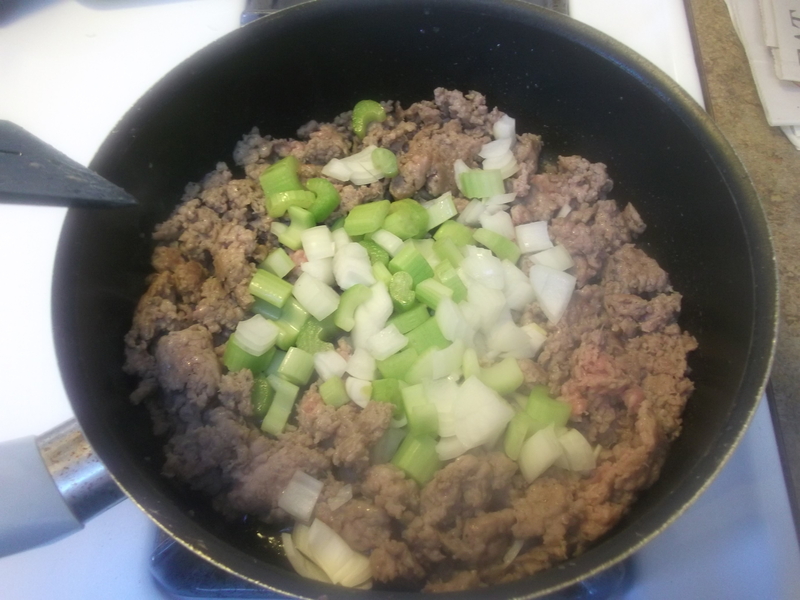 When most of the red color has gone out of the sausage, add the onions and celery and cook until they have softened, about 10-15 minutes. While these are cooking, stir the sage into the chicken stock/broth. It’s just easier to mix it now than adding it to a pan full of ingredients. Plus it gives you something to do while the mixture cooks, so add it slowly….make it last. After 10-15 minutes, the vegetables will have softened a bit. They don’t need to be completely soft, as they will soften even more as they bake. 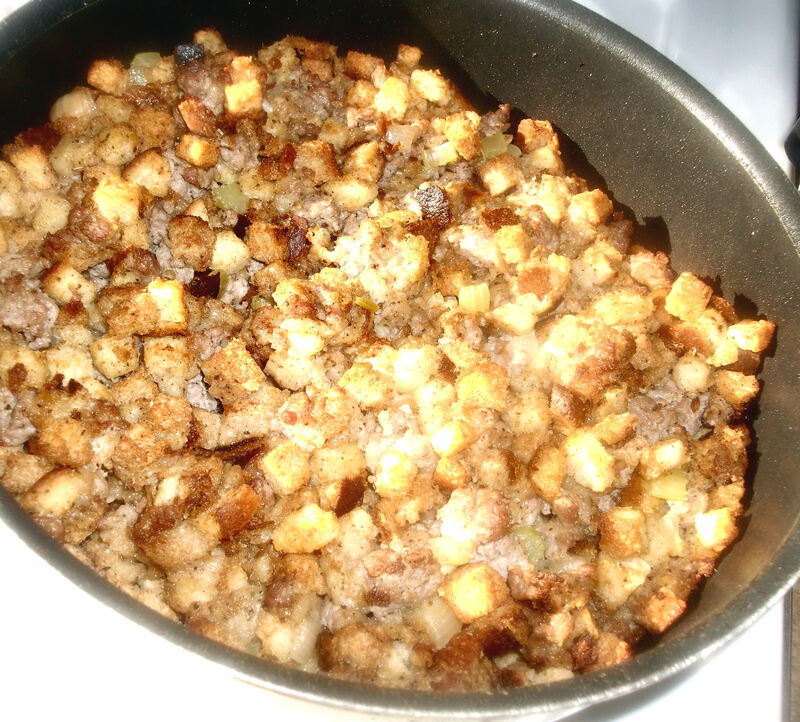 Turn off the heat, and pour in the stuffing cubes. Stir gently to mix well. This is where you hope you used a large enough pan. And I did – whew, that was close! Pour in the chicken stock (or the giblet cooking water, if stuffing a turkey). Keep stirring, lifting, and scraping to combine until most of the liquid has been absorbed and you don’t see much left in the bottom of the pan. The mixture should be wet enough that the cubes retain their shape but where the very middle isn’t quite wet. 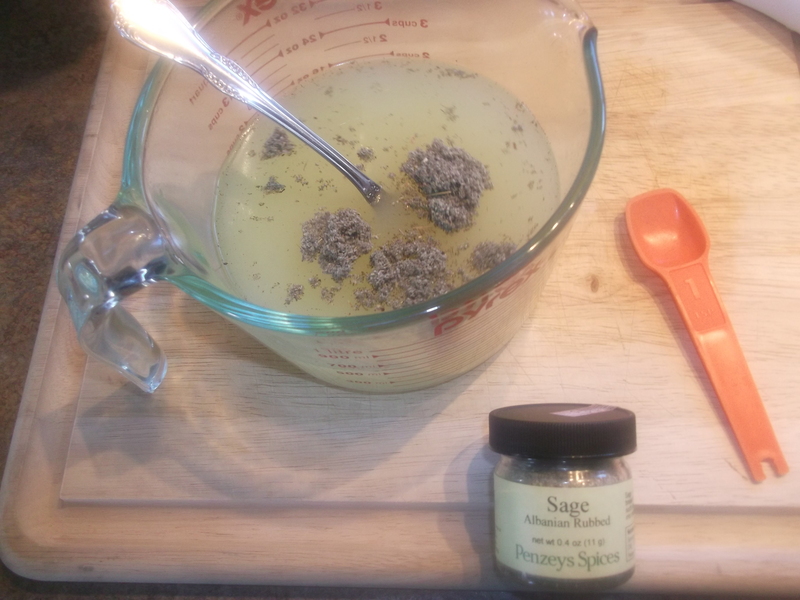 The dressing can be either cooked at this point, stuffed into a turkey or covered and refrigerated for later use. 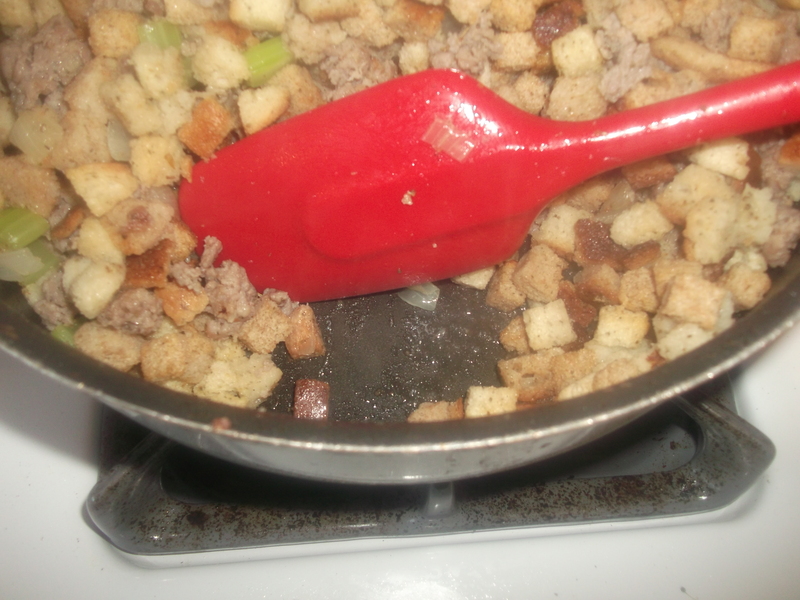 To bake the dressing as a side dish, dot the top with 1-2 T of butter, broken into smaller pieces. If it seems a little dry, add some extra liquid (broth or even water) to moisten it. If using as a stuffing, the turkey juices will add extra moisture. Bake, covered, at 350 degrees for 30-45 minutes. 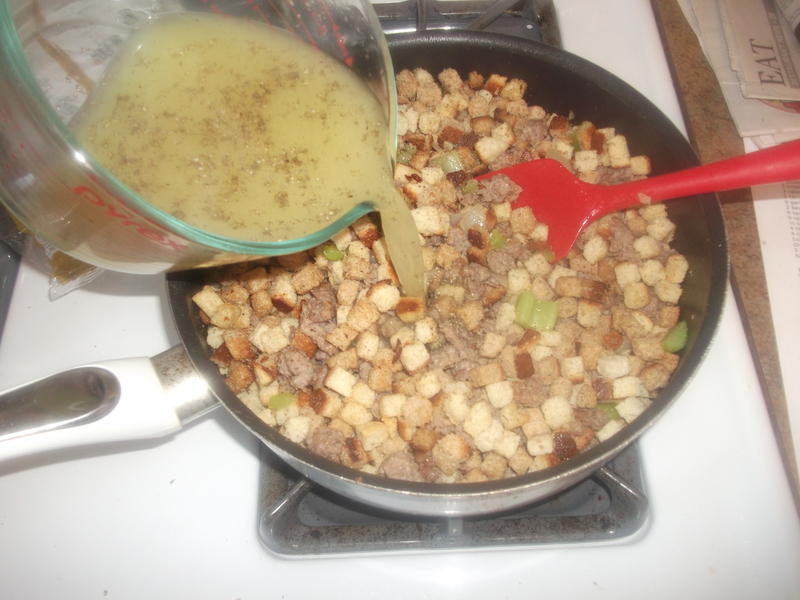 When done, the dressing will be moist throughout and golden brown on top. Plus your kitchen will smell amazing. Go ahead and sneak as many “tastes” as you can get away with. Enjoy!